With over 90 years of experience, Van der Heijden Internationale Transporten BV is the expert for the carriage of packed goods from the Netherlands to Switzerland and vice versa. Our professional team, our very modern trucks and of course many years of experience guarantee a quick and flawless transport. 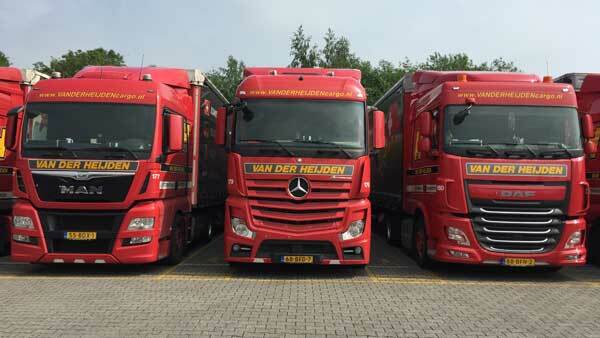 Van der Heijden International Transport BV consists of a team of experienced professionals. The thorough knowledge and vast experience are the guarantee of a reliable transport. In our business we leave nothing to chance but we are always professional and proceed thoughtfully. Logistics and transport are inseparable at Van der Heijden Internationale Transporten BV. 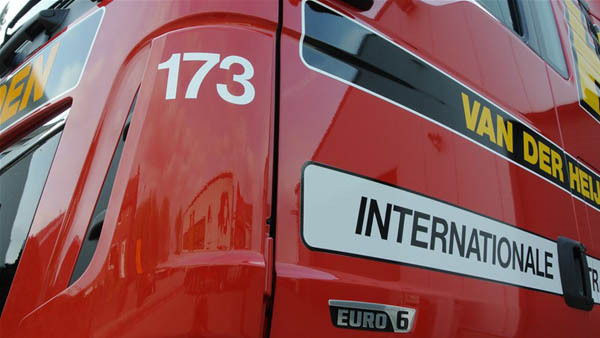 Van der Heijden International Transport BV stands for quality in the broadest sense of the word. We set high standards and guarantee a consistent, solid and reliable workflow. 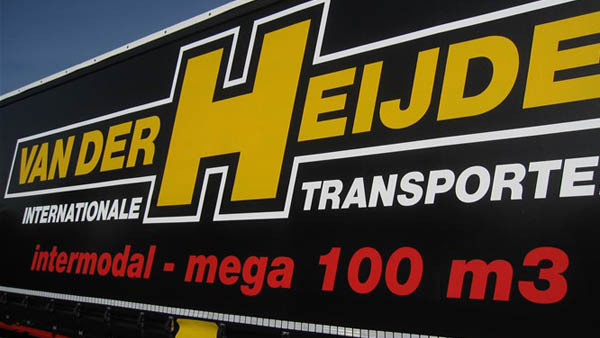 Van der Heijden International Transport BV is a company that provides transport at a high maximum level. This high level is achieved by continually anticipating innovative developments in the field of equipment and information technology. We work according to current standards and certifications. On the execution of our services we focus almost exclusively on transport to and from Switzerland. From the company’s small scale a direct relationship with our customers is ensured. Our staff play an important link between our customers and our company. Therefore, we ensure that there is continuous training. Both at the transport, selection and maintenance of vehicles and the driving behavior of our drivers, we take care of the environment and environmental aspects. As a modern family business Van der Heijden International Transport BV stands for reliability, experience, expertise and quality. 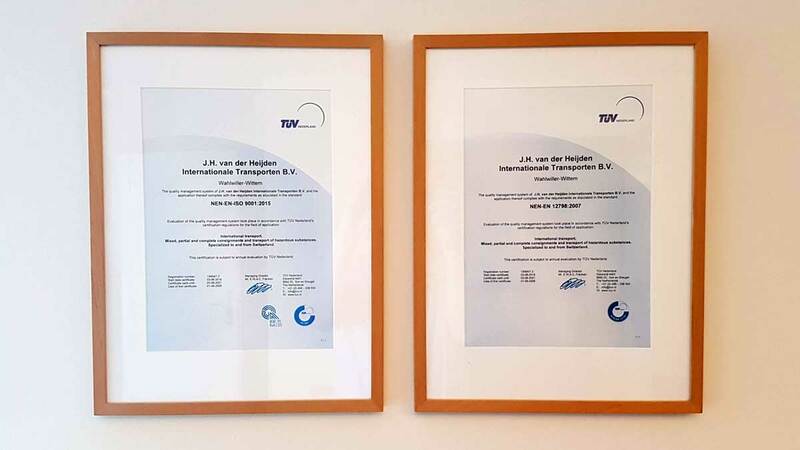 Since 1991, Van der Heijden International Transport BV is ISO certified. We meet the requirements of BS EN ISO 9001: 2008. Thanks to an efficient business, transportation orders are automatically sent to the onboard computer in the truck and charged. All shipment data will be kept for several years. We can also provide management information on the carriage and check at any time in the process for the customer or client where the goods are located (track and trace). The shortest and fastest route is no longer a problem thanks to a navigation system on board of our trucks. Congestion of roadways are identified quickly, which the system instantly provides an alternate route to the destination. The high quality of our service is not only determined by the material and technical facilities, but also the professionalism of our staff. Their knowledge and experience, and also their commitment, guarantee a fast, safe and punctual transportation. The qualification “green truck” apply to all vehicles at Van der Heijden Internationale Transporten BV Most trucks are equipped with Euro 6 engines. Only a few trucks are equipped with Euro 5 and EEV engines. These engines have low carbon emissions and noise. Furthermore, we use low-sulfur diesel and synthetic motor oils to last longer. Thanks to the on-board navigation system and trip computer, we always use the most efficient route, and we make no unnecessary mileage. Our warehouse and garage comply with the strictest environmental standards. For the cleaning of the fleet we use a private car wash portal, which uses 100% rainwater that we collect in rainwater tanks with a capacity of more than 30,000 liters. We pay close attention to safety. Not only our drivers are well trained and they receive constant (safety) instructions. The newest trucks are in addition to the standard safety features, fitted with a so-called “EBA2” emergency braking assistant which automatically intervenes when collision is imminent. In addition, there is a Lane Guard System on board. This system warns the driver if the vehicle crosses a road marking, allowing the driver to timely correct the vehicle. Also, many trailers are equipped with the so-called “optiturn” system, allowing the air pressure in the bellows to be divided in such a way that we can pass roundabouts very easily and minimal impact on the road surface and tyres.